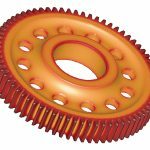 For precise, controlled deburring and surface improvements when finishing gears and other metal parts, consider the process developed—and described here—by ALMCO. 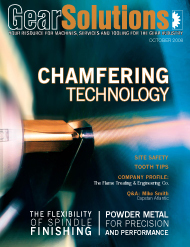 In recent years, an increasing degree of specialization in the metalworking industry has created a need for equipment that can meet complex finishing and deburring demands. Numerous types of equipment with varying degrees of sophistication are available. 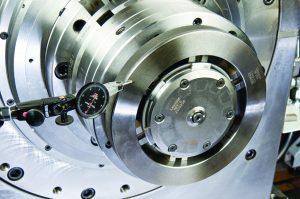 However, a mechanical finishing concept often overlooked is found in spindle finishing. 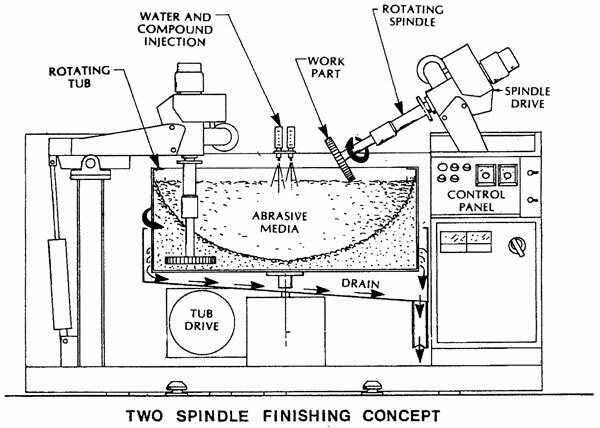 Sometimes referred to as a “slurry deburring” or “flowing abrasive” machine, spindle finishing equipment generally includes a circular rotating tub that holds loose abrasive media and rotary spindles to which parts are held or fixtured. 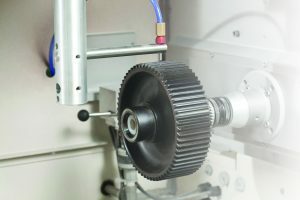 The result is a “form-fitting grinding wheel” that achieves precise, controlled deburring and surface improvements in a fast, flexible, cost-effective process. Spindle finishing deburrs or finishes a workpiece mounted on the spindle by immersing it into a rapidly moving abrasive slurry. 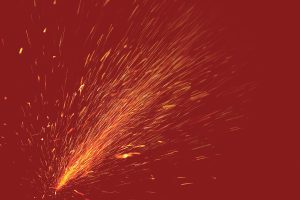 Velocity of the abrasive is generated by rotating the tub at a speed suitable for the specific process requirements—sometimes as high as 1,000 surface feet per minute (sfpm). 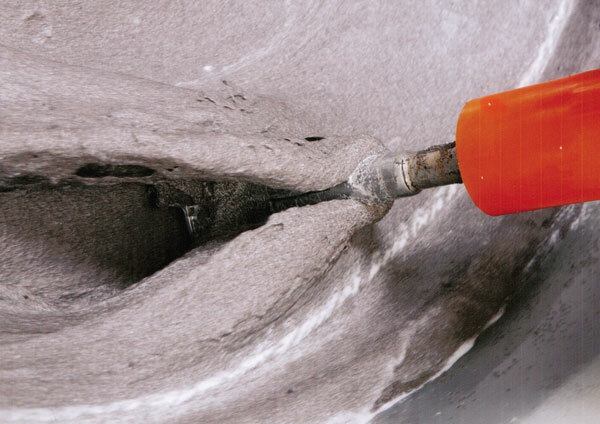 The abrasive particles swiftly flow over rough edges and through holes in the stockpiece, removing sharp edges and improving surface finishes. Fixtures usually consist of chucking devices that are spring-loaded for clamping and released by an air cylinder, making the machine operation extremely simple. 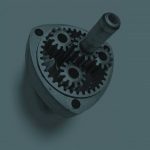 More sophisticated parts might require hydraulic hold tooling. 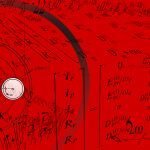 Because parts are fixtured, there is no danger of impingement, nicks, or scratches from parts colliding with one another. 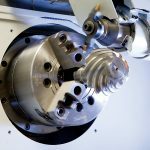 Generally, the spindle is adjusted to place the workpiece as close as possible to both the outer periphery and the bottom of the rotating tub for maximum effect. There are two reasons for this placement: first, the abrasive velocity is proportional to the radius from the tub’s center; and second, an advantageous pressure effect is created by compressing the moving abrasive between the workpiece and the tub bottom and side wall. 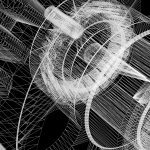 Because of their repetitive loading and unloading requirements—due to their relatively short time cycles—spindle machines are well-suited for the incorporation of industrial robotics. Such systems are almost totally automatic in operation. 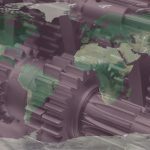 Established operating procedures are controlled effectively with repeatable cycle accuracy through programmable controls and today’s advanced electronics. At the end of the predetermined process cycle, the spindle is raised out of the processing tub automatically. 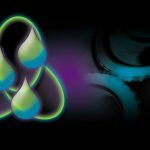 The finished parts can be manually or automatically sprayed with water, a rust inhibitor, or a cleaning solution to flush away any loose abrasive particles and residue from the abrasive mass. With the process completed, the operator or robot can remove the finished parts. In most production installations a switch actuates the fixture collet to release the finished parts. After the parts have been removed the next process cycle begins by loading unfinished parts on the fixture and repeating the process cycle. Processing media includes a variety of abrasive materials and chemical compounds. 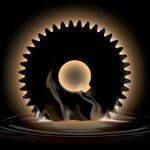 The most popular media is fine-grit aluminum oxide because it can accomplish common deburring and edge radius operations effectively and with controlled accuracy on precision metal parts. 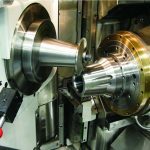 Sometimes a large-sized media is mixed with a smaller-sized media to allow aggressive action on the outer edges and surface of a part while still deburring or improving the surface finishing of small, restricted areas and holes. The smaller media reaches areas that are not effectively reached by the larger media. 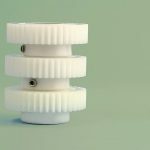 For applications that require fine micro-finishes, plastic-based media with a low abrasive content is used. For applications that require high luster and polishing effects, dry media compositions or steel media for “burnishing” are highly effective. 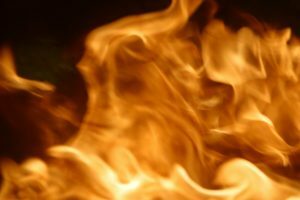 Generally, specific chemical compounds are required for each application. However, standard compounds are available that are formulated to be compatible with a variety of processes. 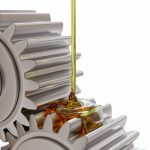 These compounds keep the parts and media clean, provide lubrication and protection against rust, and aid in the abrasive action of the media during processing. • Rapid, precise finishing of parts. 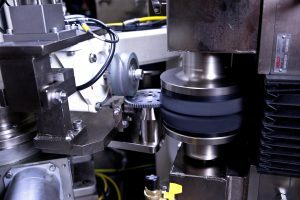 Spindle finishing uses the centrifugal forces created by a rotating tub to form a compact layer of abrasive media that exposes parts to high-density abrasive action. • Ability to achieve a range of specific finishing results with one machine. 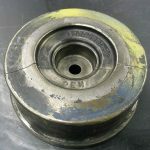 Varying the tub speed, spindle speed, part positioning, cycle time, and amount and grade of abrasive media and chemical compound affects the final finish. • Ability to maintain part dimensions to close tolerances. 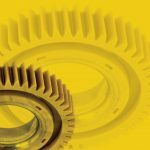 • Uniform deburring, radius forming, blending of machine or grind lines, and improved micro-inch surface finishes. These results can be accomplished on external surfaces in which a high percent of the surface is recessed, as well as on internal surfaces through proper part positioning and media selection. • Short process cycles, generally five seconds to five minutes, with an average cycle of approximately one minute. Such short cycle times result in high production. • No damage from part-on-part impingement, since parts are fixtured. • Process repeatability. Finishing is achieved under controlled process conditions with the tub speed, part position, media and compound all capable of being automated. • Easily maintained production requirements or operational standards. 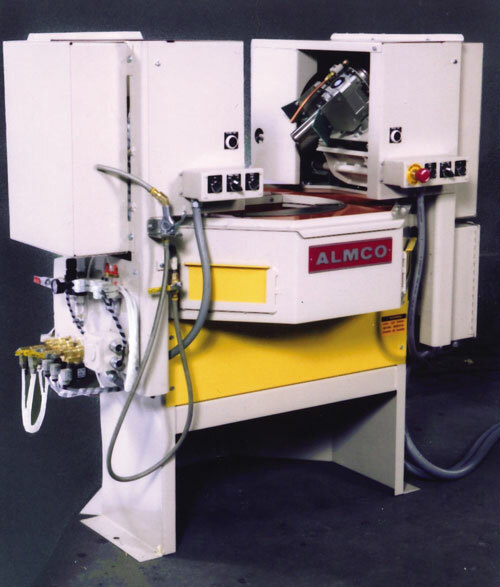 No single finishing concept can satisfy all mechanical deburring or finishing needs. 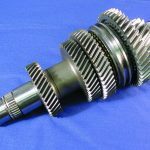 However, improved technologies in the design of basic spindle finishing machines—as well as vast improvements in automation, fixturing methods, and finishing media and compounds—are generating increased awareness among gear manufacturers and others of the potential of spindle finishing.